When LinkedIn introduced the new look and feel for the LinkedIn Homepage a year ago, their goal was to create a customized experience that would make it easier for people to begin each day armed with the knowledge and insights you need to be productive and successful. Today they introduced two new features to add to to that productivity toolkit: “Who’s Viewed Your Updates” and “You Recently Visited”. Both features can be found on the right-hand side of the Homepage and both are intended to provide you with more personalized insights on your activities and engagement across LinkedIn. 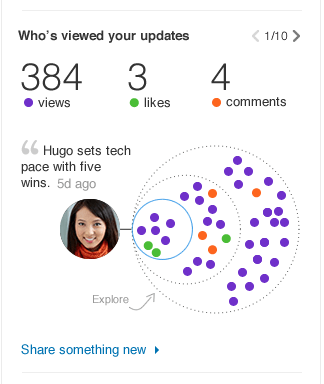 Who’s Viewed Your Updates provides you with one simplified snapshot of what you’ve shared over the past 14 days, who has seen it and how it has been received (liked, shared). In addition to the engagement from your 1st degree connections, Who’s Viewed Your Updates will also show you how many of those members in your 2nd and 3rd degree networks, engaged with what you shared. Now you have real-time feedback on how the content you read and share resonates within your network, giving you more opportunities to build your professional brand and make connections with new professionals that share common interests. With this new tool, dedicated LinkedIn users have extra information that should help them hone their LinkedIn posting, tracking what works and using similar strategies in the future. This real-time resource can also help users make connections with professionals who find value in their posts. The new “You Recently Visited” feature includes highlights of recent profiles you have viewed, searches you’ve done and group discussions you have viewed or participated in. This makes it easier to retrace your steps, re-engage in conversations or follow-up with that old colleague you intended to connect with. New streamlined navigation: To make it easier for you to quickly locate the features and content that are most valuable to you. Add rich media to your updates: Share pictures, videos and documents that add a richer and more visual component to your professional updates. Call out your connections: Directly mention one of your 1st degree connections in your updates from the Homepage to start conversations, share knowledge and engage with your connections on LinkedIn. We look forward to bringing even more personalized insights that add value to your everyday experiences on LinkedIn. As a psychology/visual communication major this is a no brainer for me. It has been a constant struggle however to convince people of just how important it is for Social Media. So here is, fact based information on the why of it. It is common sense that the images we use in our adverts are important. However, to leave it at that would be a gross understatement. You and your audience are extremely visual creatures. Over one third of your brain is dedicated to processing visual input from the world around us, and this includes the adverts we see on our screens. The correct visual imagery can provoke some of the most primal emotions that drive action and behaviour. So how much time do you put towards picking the right image for your advert? Hopefully it isn’t an afterthought; hopefully it isn’t a quick detour through Google Images. Below we consider what to think about when choosing, evaluating and refining your images. From here, you can then design/pick the image itself much more efficiently. For example, if you are displaying images to a younger demographic on Facebook, you will want to pick something that is relevant to them, looks good on a white background, and stands out from the competition. However, you should also work within additional constraints to have the best result. You will need to consider brand continuity and style guidelines; this is all about managing customer expectations. For example, if you have a very stylised image advert with a red and black colour scheme, and the landing page for the advert is white and blue (your company colours), you will automatically weaken the effectiveness of the image advert. However, with that said, don’t let your existing style guidelines prevent you from running the correct image advert design. Create a specialised ‘squeeze page’ that matches your custome designed advert, if you need to. My company commissioned a beautiful banner advert collection by a well established and talented designer. We all loved what we saw: the attention to detail, the new choice of colours, the clever call to action, etc. We put some big bucks behind it and let it rip, both through Google Adwords Display network and affiliate partners. At the same time, I knocked up a garish, brazen, bold, basic banner that matched our landing page. Not only did my image convert users who had clicked it much more effectively, it produced x3 as many click throughs as the more beautiful and detailed banner. The two take home points here are that the best looking banners won’t always win, and however they look, they should match the page they lead to. If this means creating a new specific squeeze page that matches the advert style, then so be it. It will be worth your time. Clearly, it is crucial that you measure the performance of your image adverts. Turning our attention specifically towards Facebook. Clearly the platform offers different ways for you to use images in your campaigns, but it doesn’t matter whether it is the 100x72px ‘right-hand column’ or the larger real-estate offered by the News Feed, the image is absolutely crucial for a successful advert on Facebook. My data would suggest that it is the single most important element of your advert campaign. Specifically, a basic analysis of variance (ANOVA) shows that the vast majority of the variance accounting for how well an adverts performs (regardless of how it is measured) can be attributed to the image. When I am designing or picking new images, I follow the same guidelines listed above. Facebook does put a number of important constraints on your use of images in promoted posts and adverts. Most notably, when you wish to promote an image that you have posted to your Page’s Timeline, you may be very aware of the 20% text constraint. Facebook splits your image into a 5×5 grid. If text appears in 6 or more grid locations, it will fail the 20% text on image check. Putting text on images is not something Facebook wish to endorse, so think carefully whether you can convey the same point using the image itself, without resorting to text overlays. You may be familiar with the concept of testing, measuring, tweaking and repeat on your advert copy and headline. However, the image is so important it deserves the same level of attention all by itself. Make sure that you have a tool that allows you to quickly upload the numerous image variations that you make and promptly rollout the different overall advert combinations. Create three or four very different images and see how they do. Once you start to see a bias towards one outperforming another (hint: use metrics like CTR, and pixel tracking with conversions), focus on it and carefully consider what is it about the image that drives audience behaviour. Often it will be something simple like the colour, but on occasion something more subtle will have caused the variation in performance, and that’s where the real analytical fun begins. In considering who the image advert is for, and where it is presented, you will gain better insight into why it is working, ultimately aiding you in creating the perfect image for your advert. Ok so I admit I am somewhat fond of Pinterest too. Brought to you from the fine folks at shortstack’s socially stacked! One of my favorite social platforms for discovering content and keeping up with social media news, trends and more, is Pinterest. Whenever I’m in need for some inspiration for an upcoming blog post or I want to find an infographic for our “Infographic of the Day” series, I check Pinterest first. – See more at: http://www.sociallystacked.com/2013/06/9-pinterest-accounts-every-social-media-marketer-should-follow/#sthash.3wOEt1GV.dpufSince Pinterest is such a great resource for me, I thought it would be fun to put together a list of my favorite accounts to follow. These nine Pinterest accounts are where I find the majority of the best content regarding social media. These are active pinners that I think every social media marketer can benefit from following. In my opinion, HubSpot is the industry standard when it comes to content marketing — they’re total pros! I like to follow their Pinterest account to get inspiration and keep up with new content marketing practices. Mashable is the largest independent website dedicated to news for the “connected generation.” Their news, and the content they pin, is like a marriage of BuzzFeed and All Things Digital– it’s informative and entertaining! Follow Mashable on Pinterest to stay on top of all the latest popular memes and business news for your favorite social platforms. DashBurst shares content that’s in the same vein as Mashable’s. In their words, it is, “Your guide to the web and social media.” They’re true to their word. Check out DashBurst’s Pinterest account for the latest in art, culture, business, tech and design. I find myself re-pinning Sprout Social’s content regularly. The thing I like best about their Pinterest account is that their boards are organized and titled really well. They have an individual board for each social network, plus social media boards broken up by size of business: Enterprise, small business, startups and nonprofits.There is literally something for everyone here. M2 Media Management is a social media management and maintenance agency from Atlanta, Georgia. I started following their pins when I first got started on Pinterest. They pin a lot, which is great! And everything M2 Media Management shares is quality and relevant to the interests of any social media marketer. Mari Smith is the Queen of Facebook, hands down! I follow her on every other social network and she does not disappoint anywhere. Mari doesn’t pin as much as some of the other accounts I follow, but what she does share is almost always worth a repin. She’s always on top of the trends, especially when it comes to Facebook marketing. Melonie Dodaro is another social media expert I recommend following on Pinterest. She’s Canada’s #1 LinkedIn Expert, as well as a social media speaker, trainer, author and founder of Top Dog Social Media, a social marketing agency. And did I mention, Melonie’s also an avid pinner?! One of the coolest boards she has is her “People to Pay Attention To” board which includes 91 pins of the best people to follow for tips and strategies on social media marketing business development, sales and marketing, branding and online marketing. Most social media marketers are familiar with Jay Baer. He’s a hype-free social media strategy consultant social media keynote speaker and author. Most of what he pins is from from Convince and Convert, his social media blog (also definitely worth checking out). Follow Jay on Pinterest to stay on top of social media trends, news, tips and solid advice. I had to include ShortStack, of course! Hey, I admit, I’m a little biased. If you browse through our nineteen boards, you’ll find tons of free social media resources, including: eBooks, PDF goodies, infographics, podcasts, videos and more. Our most popular boards are our “Social Media & SEO” and “Social Media News & Tips” boards. Follow these, and the rest of our seventeen boards, to discover awesome and helpful content to help with your business’s social media efforts — and for some insight into what goes on in our crazy (that is, crazy in a good way!) office! I hope you like this roundup of the best Pinterest accounts to follow if you’re a social media marketer. In the comments below, please feel free to leave links to your Pinterest account or other Pinterest accounts you think are worth following. We’ll be sure to check out and follow your boards. Happy Pinning! 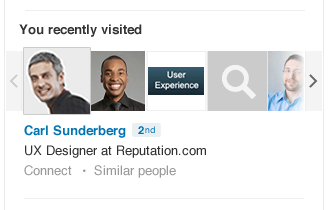 Well DUH…This must be one of the most underused features of Google+ EVER! Don’t think about it, just follow the steps and do it. It’s free and you have literally nothing to lose. It helps you connect with your friends, fans, and customers. It provides Google with information that we can use to help determine the relevancy of your site to a user query on Google Search. Your site will become eligible for Google+ Direct Connect. If your website is already verified in Webmaster Tools, then the verified webmaster can approve a request to connect your website to your Google+ page. Make sure you’re using Google+ as your page. Click Profile on the left. On the ‘About’ tab, click the Link website button next to your website URL. If we know the webmaster for this website, we’ll give you the option to send a request to the webmaster to approve the link. Requesting approval will reveal your email address to the site owner. The verified webmaster can confirm the link in Webmaster Tools. Once the link has been approved, you’ll receive and email. You’ll also see a checkmark next to your website on the ‘About’ tab of your page’s profile. Please note! Redirect URLs should not be used. Only the primary URL for your website should be used. Copy and paste the code snippet provided to the <head> tag of your website and click the Test website button. We’ll check to make sure you’ve added the snippet to your website correctly. Click Done when the check is complete. Wow, really…wait do I care? Ok so I personally don’t think that this is a “big”deal, in fact it seems like a natural and i wonder why it has taken them so long, but I though I would post it anyway. Who’s the Instagram of video? Instagram, of course. In Facebook’s hyped announcement today, Instagram CEO Kevin Systrom announced that the photo-sharing service is rolling out video-sharing. “This is the same Instagram that we all know and love, but it moves,” said Systrom. Using the same interface with the addition of a video-camera icon, the user can record 15-second videos with multiple clips. Users can choose from 13 new filters tailored to video. The service also includes a stabilization feature to limit the jiggling effect of videos shot from handheld devices. “It’s a little touch; it’s the Instagram touch. These are the little details that make all the difference,” Systrom said. The new feature is rolling out today to all users in iOS and Android updates. Facebook’s business interest in video is clear. Mobile video viewing is expanding. Nearly 75 million people in the U.S. will watch videos on their phones this year, up 17 percent from last year, according to eMarketer. Video advertising, the fastest growing digital format market, will exceed $4 billion in the United States this year, according to eMarketer. Brought to you via the fine folks at Marketing Land. I thought I would pass this info on as it is important to anyone who in engaged in Social Media Marketing. In fact, the most effective way I’ve discovered to really improve at my job is to royally screw it up once in a while and learn from the mistakes. In the interest of adding to our collective wisdom, here are 10 of the biggest mistakes I’ve made so far – and my tips to help you avoid the same fate. OK, this first one is probably a little controversial. How could reading about what’s going on in the industry possibly be a bad thing? I’ve come to believe that spending too much time in the echo chamber is bad for your social media strategy and, more importantly, your creativity. Read too many blog posts and you run out of time to do anything else — not to mention that it starts to seem like all your good ideas are derivative, everyone knows more than you, and everything that can possibly be written already has been. Reading too much also directly contributes to what might be the worst mistake on this list: creating too little. Anyone can read a lot. Building your own place in this industry as a thought leader comes from explaining what you’ve learned and building your own thoughts on top of it – whether that comes in the form of writing, presentations, videos or other kinds of content. Guess what? Most people aren’t on social media networks 24/7. It’s our job to dissect every viral video and new meme as it happens, but your audience might actually be out, you know, having a life. It’s important to remember that we’re the outliers here, and that our unique position allows us to be great curators for our audience. Who’s the George Takei of your industry? Why isn’t it you/your brand? The real-time nature of social media means that it really never stops. I’ve answered Twitter queries on Christmas and responded to Facebook posts at family gatherings, and that’s fine – it comes with the territory. But, social media is insidious at pulling you in further. Suddenly, there’s no moment that seems special enough to just live instead of to document, no conversation important enough that you can’t just take a quick peek at your phone during it. And, in the same way that the photos we take at concerts pale in comparison to the real thing, a life lived on social media isn’t quite the same as actually living. There’s really nothing I can say about this that the brilliant Condescending Corporate Brand Page doesn’t say better in this image. Chasing irrelevant, empty “engagement” for no good reason is a fool’s errand in the most literal sense of the phrase. I work with a whip-smart, funny and truly interesting community. I bet you do, too. That’s not to say that it can’t be challenging. But, during the moments when your audience doesn’t take the bait on that perfect Facebook post or is peppering you with questions you don’t have time for, it helps to remember how lucky we are to be doing this in the first place. We’re engaging with smart people, learning daily, building real relationships – and getting paid for it. If you read enough about how social media ROI is impossible, incomplete and the wrong question to ask, it’s tempting to throw up your hands and give up. I did that for a while. It’s a bad idea. True, social media ROI may be an elusive beast, but that doesn’t give us license to sit back and do nothing. Insights don’t happen without measurement. Confidence doesn’t happen without measurement. Promotions don’t happen without measurement! Define social media’s worth for your business and measure it — even if it’s difficult or you can’t find a tool to do it for you. The only thing worse than measuring nothing is measuring the wrong things. When you do that, you’re just wasting time! That said, I’ve definitely done some time focusing on “locker room metrics” that had no impact on anyone’s bottom line. It’s natural to start there, but eventually we all have to learn to measure what matters, not what’s easiest. Until you’re sure what to measure, no tool can save you. But, it doesn’t seem that way at first. I remember turning to each new tool, thinking that it would finally be the quick-fix, silver-bullet answer to my ROI questions. Once you accept that tools are only as good as their operator, you’ll achieve the right mindset to use them correctly – as a supplement to your critical thinking, not a replacement for it. If you’ve worked in social media for any length of time, you’ve probably had to justify your job to people who think you just play on Facebook and Twitter all day. So you trot out your custom Google Analytics dashboard or start talking about KPIs and the sales funnel. All of that stuff is great – crucial, even – but it’s possible to get so focused on defending social media as a “real job” that you risk sucking all the fun out of it. It’s important for brands to remember that when it comes to social media, we’re visitors whom our audience has invited into their circle. Social media is where they share personal stories and photos. Where they connect with friends. Where they go to relax and have fun. If we’re going to crash the party, shouldn’t we bring champagne instead of sales charts? Those are some of my biggest social media mess-ups (so far). Can you identify with them? How do your social media goofs compare? Tell me about them in the comments. Opinions expressed in the article are those of the guest author and not necessarily Marketing Land. If you haven’t heard yet, then you may be surprised that Google Plus Comments plugin is now a real thing for self-hosted WordPress users. As you have probably already seen last week that Google announced that Google Plus Comments were coming to Blogger, Google’s free blog platform. Immediately plugin creators were scrambling to get their hands on the right coding to bring this valuable option for people with WordPress blogs. And now, WordPress can proudly say that there is a plugin that is worthy to be used on our sites. You can get this social commenting plugin here. Is Google Plus Comments Plugin Right For You? With the ever famed CommentLuv plugin that most bloggers use, all the way to the popular DISQUS comment moderation plugin, there are not that many decent comment plugins that you can use besides these two. However, with that said, you can find many articles with these two as the topics telling you why the other one is bad and why you should use the one they’re promoting. While there is not enough time to tell whether or not the new Google Plus comment plugin will disrupt any users that rely on these two plugins, it has been found that most of the websites that had DISQUS are dropping it for the Google Plus commenting system. If you are a fan of the Google Plus platform, then you may want to consider adding this form of commenting on your site. It is no secret that you can use Google + to boost your SEO, and with that in mind, you are taking it a step further by implementing this tool into your site through the form of interaction and social networking. If your site gets a lot of interaction anyway, then placing this plugin will not only help your results on Google, but will also increase your Klout score because of the extra activity that is happening on your posts. But how do I know which one is right? There are positive’s to be said about each one of these plugins that you can activate on your blog. The CommentLuv plugin, free and paid editions, both help you to network your site through something that is called CommentLuv Blog Lists. It helps you network your most recent blog posts on other people’s sites and allows more traffic to be directed to you in that way. The DISQUS commenting plugin is also very positive towards your site as well. It sort of works backwards to the CommentLuv plugin. It keeps the reader active on your site, even though they may not be on your site right then. If another blogger has DISQUS activated and that person has a notification from your site, it will tell them from wherever they are. There are many positive affects of having this plugin on your site. You already know the social marketing aspects of it. Someone could comment and blast it all over their social network on Google. That’s definitely a positive. However, I want to be able to give you all of the information before you make your decision. There are many people that feel that you should NOT install this o your site basically because it’s not an official Google Plus plugin, but a knock-off creation of someone else. Also, you have no control or moderation over this plugin. Anyone can comment, which means that anyone can post obtrusive links as they please on your site! Stick with what you know until Google comes out with their official plugin for WordPress. I know its a great thought to have your site have the opportunity to be seen by millions, however, the kinks have not been worked out on this plugin yet, and I would go with the good old DISQUS, CommentLuv, and even Jetpack until you can see where this thing will go in the future! Why the half-life of a Pinterest pin is thousands of times longer than a tweet or Facebook post. The useful life of the average tweet can be measured in minutes. Most posts on Facebook exist in users’ streams for perhaps a few hours. But a pin on Pinterest? That can last thousands of times longer, according to a new study by Piqora (formerly Pinfluencer). That’s important information for brands like Sephora, which says its Pinterest followers spend 15 times more than its Facebook fans. And it’s good to know that if you spend time picking out the perfectly shareable pin, that effort won’t disappear within minutes. The lag between pinning and visiting can be up to 40 days. The key difference is that while Pinterest is a social network, it’s also an ideas-and-inspiration website, whereas Twitter and Facebook are social networks with a massive emphasis on immediacy. When people visit Pinterest, they browse, they search, they surf, and they uncover more pins. Verma, who used to be a director of product management at Yahoo Search, says that when web surfers go to Google and search for something, if they don’t see it in the first page of results, they think Google “didn’t get” what they meant, so they go back and reformulate their query. That doesn’t happen on Pinterest. One other difference is that Pinterest pins are accompanied by a lot of metadata. While Facebook is trying to apply metadata to people’s status updates and adding structured updates like how you feel so that it understands more about what and why you’re posting, and can improve graph search, Pinterest has that built in. In fact, a full 95 percent of pins are going to boards that are named after categories, Piqora says, and five percent are going into explicitly commercial boards with titles like “I want this” and “My dream list.” That’s almost a social CRM for retailers, who can check those boards and see which products are hot. Pinterest’s virality ratio has gone up 42 percent between the last quarter of 2012 and the first quarter of 2013. In 2012, pins published by brands were re-pinned at at .21 ratio, meaning that every brand pin would be repinned .21 times. Now, the ratio is .3. Which means that either marketers are getting smarter about what gets repinned on Pinterest, or Pinterest users are getting more interested in sharing. Thanks VB for the great information! Ok so I am still a newbie, but i found this answer the best and simplest one out there! Such links are most commonly used for jumping from a table of contents to the beginning of a chapter or section (as in Wikipedia). To do this, you need two pieces of code (in the html editor, of course): one at the source point and one at the destination point. Where I’ve written UniqueName you can write anything – just make sure it’s exactly the same in that source/destination pair (including capitalization), and it’s unique to that pair (for another link like that, you’ll need a different UniqueName). Have you ever wondered how you can get traffic to your blog? That goes without saying doesn’t it? We all scrounge around looking for ways to get traffic to our sites and make more money with it. Recently I have found one of the greatest things that a blogger can get into to become successful! Every blogger is looking for new traffic and faithful readers to their site. When you can successfully add these to your site, you become more visible to a lot more people. The reason being is that these people will share your blog to their friends on social media sites or tell someone about it. looking for people that you can share your posts with! This is where Blog Engage can help you. First of all, it is a community of bloggers that are looking to meet new people and make connections with. So right off the bat, everyone has the same perception…making the connection with others. These are people that would not have normally found your site otherwise. When you join this community you are allowing these people to find you and your site, filling that “traffic” hole that you are desperately trying to fill. Once you join this community, traffic is a given. The very first day I joined, my traffic went up 40%! So the traffic is a given. Once a member, this will happen. It’s inevitable. However, the traffic is not the most important part of this community. What is the most important part? Also, once a member, you are given the opportunity to submit your blog posts to the community. Of course these are the posts that people will see to allow them to visit your blog, however, when you post, you are building high quality backlinks that can be added to your SEO strategy! Blog Engage is a high ranking site online and it can benefit your blog to become part of this opportunity for this purpose as well. They have many options that you can use to join their site, and you can pick the one that benefits your site the best, however, the song remains the same. If you are looking for great backlinks, then this is one of those places that you should be involved with. So is this the most important part? Blog Engage has many important features. Brian Belfitt has created on of the greatest sites that can meet your blog’s needs in every way. However, the most important part about Blog Engage is what he didn’t create…he attracted it. The most important part is the people. These are the connections that you are inevitably going to make while a member of this community. Making friends and creating relationships are the most important thing a blogger can have. A relationship that can last throughout your blogging career cannot have a price put on it. This is what makes Blog Engage so great. Making connections with other bloggers is the most important part of any blogging strategy, and Blog Engage supports and encourages this! You are “engaging” with other people on this site. You are voting for their blog posts and they are voting for yours. You are commenting and interacting with these people and vice-versa. This community has all of the means that you can use to create friends and benefit your blog. From chatrooms, comment sections, voting, and instant messenger, Brian has given you all the tools that you will need to unfold the most important part of his site. —This offer has expired—But still a great deal at $9 per month! 3 MONTHS FOR THE PRICE OF 1!! While Blog Engage is a great deal with a starting price of only $9 per month, my good friend Brian is allowing me to offer this to you guys for a special price! During the month of November, you can get the Platinum Syndication & Marketing Service that they offer for only $9 for the first three months!You are already getting this at a great deal at the regular price, but now you can experience three months for the price of one! This is really a great opportunity for someone who is looking to boost their traffic, get a jump on their SEO strategy, meet new people, and, all in all, boost their blog as a whole! Don’t miss out on this opportunity, because it’s not going to last! Get a great deal at Blog Engage Here! ($9.99 USD)!